The Guardian reported last week that Apple is building a self-driving car. If the report proves true, Apple will join Google in the autonomous vehicle race, and the dream of driver-less cars on our highways may be one step closer to commercialization. Envision IP analyzed Apple’s patents and published patent applications related to vehicle technology to determine if the company’s patenting activity may shed light on its R&D efforts for self-driving cars. While Apple owns a number of patents and applications related to navigation technologies, vehicle-to-vehicle communications, and transportation mesh networks, it does not appear to own any patents related specifically to vehicle hardware and manufacturing (i.e., frames, chassis, bodies, etc), or patents related to engines, drive-trains, fuel cells, or hybrid/electric power means. The bulk of its automotive-related patents are primarily focused on user experience and vehicle tracking, and not to specifically to physical elements required to build a vehicle. For example, recently issued US 9,080,878 and US 9,019,129 relate to a mobile device that can identify the location of a vehicle in a low signal environment, such as in a parking deck. 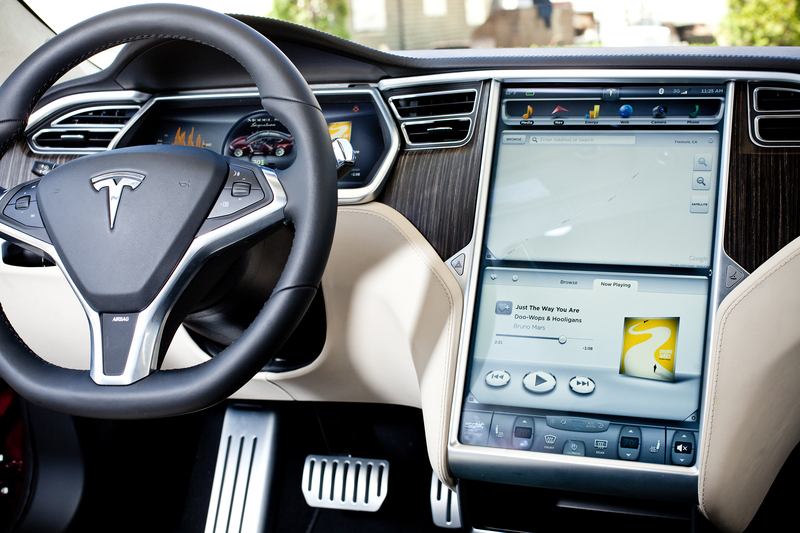 Another interesting patent is US 8,482,535 which relates to a touchscreen interface for a vehicle. The interface provides various user controls for lighting, air conditioning, the radio, etc. 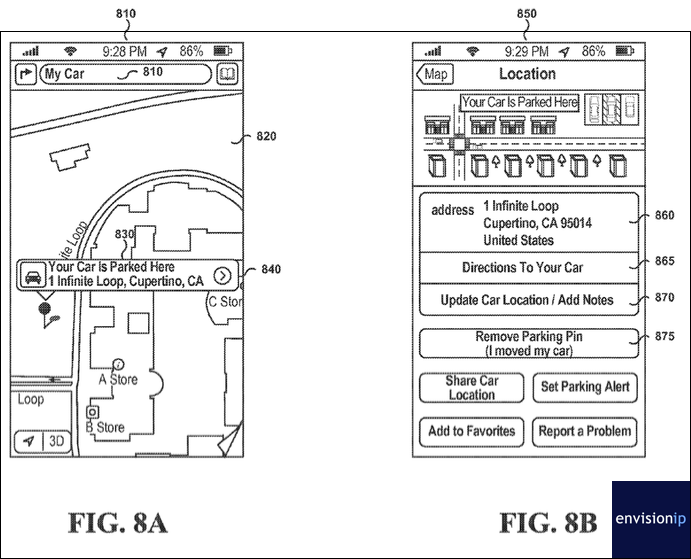 Other Apple patents and applications relate to predicting vehicle behaviors based on historical patterns, vehicle-to-vehicle communication systems, and navigation technology based on situational awareness. We identified 36 patents owned by Apple which relate to technologies that may be incorporated into vehicles and/or vehicle network systems. As described above, these patents do not relate to physical vehicle structures, but rather software and network systems that could possibly enhance a user’s vehicle experience, and but which are not specific to autonomous vehicle systems. Other automotive technology patents owned by Google are related to navigation, road sign and road condition detection, avoidance of emergency vehicles, and pattern detection using distributed vehicle data. Google’s patents in the space date back to the late 1990’s, with many of the navigation-related obtained through the acquisition of the Motorola Mobility. 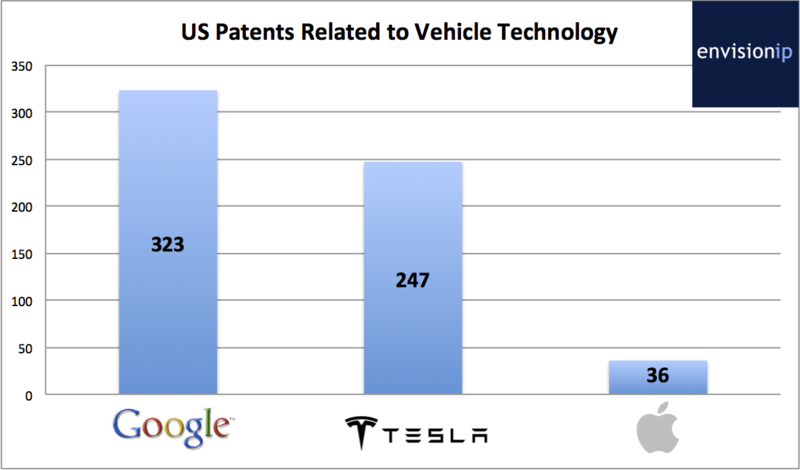 In addition, Google has patents directed specifically towards autonomous vehicles dating back to 2011. Given Apple’s interest into expanding into this area, it certainly has some catching up to do with Google in terms of patenting its proprietary technology surrounding driver-less cars. However, both Google and Apple lack patents related to core vehicle hardware, such as frames, doors, vehicle electrical systems, engines, batteries and fuel cells, and other related components. We published research last year analyzing Tesla’s patent portfolio, and compared it to the patents held by major automotive manufacturers. Apple and Google, and other technology players, including Uber, may have to rely on licensing from traditional automotive manufacturers in order to actually commercialize and offer autonomous cars to the mass market. 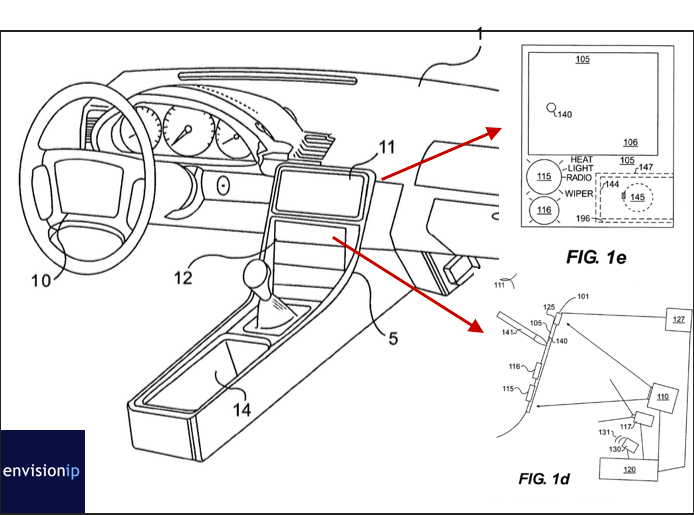 Google is not the only technology company with a large portfolio of patents in the automotive space; Samsung, LG, Sony, Blackberry, and Nokia all own patents related to navigation and mobile-vehicle device integration. In addition, Ford, General Motors, Honda, Toyota, and Hyundai own US patents related to autonomous and self-driving vehicles, as well as electric, solar, and hybrid powered vehicles. These automotive manufacturers may also be likely candidates for joint-ventures or cross-licensing deals. Furthermore, Apple is no stranger to acquiring innovative technology companies outside of its core business focus, as shown by its recent acquisition of augmented reality technology firm Metaio. It would not be surprising if Apple bolstered its patent coverage in the autonomous vehicle space through acquisitions of companies and/or patent portfolios.